Rainy... or just "drippy" this weekend? By Jim Purpura. Posted January 19, 2012, 8:25 AM. A strong ridge that has been keeping us dry, for the most part, since December has started to retreat southward. 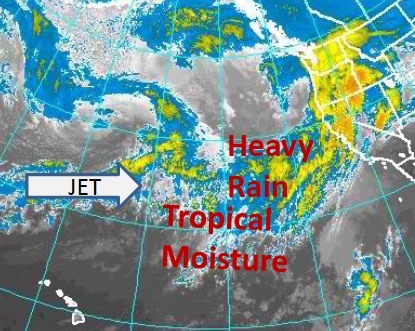 In its place, a strong Pacific jet stream has allowed an "Atmospheric River" of very moist air to flow into the Pacific Northwest. Rain totals the next few days will be in excess of 10 inches in the coastal mountains of northwest California and southwest Oregon. Unfortunately most of that moisture will not make it down to Southern California. However, rain will begin late Friday night and continue through Saturday, but only the southernmost tail of the storm will travel though our region. There may be a few showers Saturday night in some areas, then a second, lighter round of rain and showers will return for Monday. It's a fast traveling storm, so there will some gusty winds ahead of the main front. Rain totals in the Inland Empire will be around a third of an inch total through Monday. Simi Valley will be a bit luckier with up to three-quarters of an inch. Mountain areas, particularly southwest facing slopes in the San Bernardino Mountains, may see rain totals in excess of one inch. Snow will be minimal in the mountains. The warm air with this storm system means the snow level will be around 9,000 feet on Friday, lowering to 6,000 feet by the end of the weekend. Expect only light snow accumulations above 6,000 feet. After the storm departs on Tuesday, expect the persistent La Nina ridge to rebound, bringing considerable warmer weather by the middle of next week.